Since beginning a large-scale offensive campaign on 6 June, the US-led coalition has continued to advance in Raqqa, the de facto capital of the Islamic State (ISIL) in Syria. The Syrian Democratic Forces (SDF), a network of Kurdish and Arab militias supported by the US-led coalition, has said they have opened up a second front inside the city. The recent offensive comes after a months-long effort by the SDF to cut off Raqqa, and ISIL within it, from outside support. 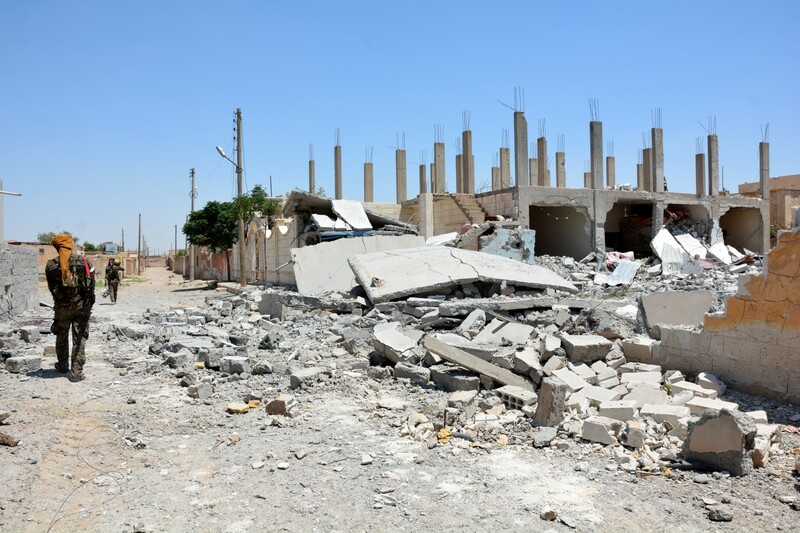 However, despite the seeming success at loosening ISIL’s grasp on Raqqa, the number of civilian casualties has continued to increase as the US-led coalition’s attacks have intensified there. Paulo Pinheiro, chairman of the UN Commission of Inquiry, told the UN Human Rights Council on Wednesday that US-led coalition airstrikes are responsible for a “staggering loss of civilian life” in Raqqa, having caused at least 300 civilian casualties and the displacement of 160,000 since March. If the coalition’s offensive on Raqqa succeeds, it could liberate the city’s civilians, including Yazidi women and girls, that “the group has kept sexually enslaved for almost three years as part of an ongoing and unaddressed genocide" according to Pinheiro. However, he added that the fight on terrorism must not be “undertaken at the expense of civilians." Additionally, Pinheiro reported on efforts coordinated between the Syrian government and armed groups to evacuate civilians from conflict areas, which he asserts can "in some cases amount to war crimes” as forces have forcibly removed civilians. Civilians also continue to face a direct risk from ISIL, as those who have successfully fled from Raqqa have reported that ISIL fighters have begun killing any who try to escape, and fighters have been using civilians as human shields. The conflict situation has indirect consequences for civilians, as well. On Tuesday, 13 June, the UN refugee agency (UNHCR) called for better access to Raqqa, claiming that close to half a million people are in need of humanitarian assistance. UNHCR spokesman Andrej Mahecic cited several barriers that have made aid operations "costly and complex," such as a serious lack of resources and funding, as well as the blockage of land routes by other parties which has forced the aid agency to rely solely on airlifts. ICRtoP member Human Rights Watch has urged the US to investigate airstrikes that have allegedly targeted civilians in Syria and Iraq, expressing particular concerns about the alleged use of white phosphorus by coalition forces in airstrikes, saying it “poses a high risk of horrific and long-lasting harm” for civilians in densely populated cities like Raqqa. HRW added that "White phosphorus fragments can exacerbate wounds even after treatment and can enter the bloodstream and cause multiple organ failure”. In this vein, HRW has urged the US-led coalition to make protection of civilians a priority. Burma has rejected the UN fact-finding mission to investigate allegations of mass killings, gang rapes, and torture by security forces against the Rohingya Muslim population. Aung San Suu Kyi said on Monday that the probe "would have created greater hostility between the different communities,” adding that the Burmese government did not “feel it was in keeping with the needs of the region in which we are trying to establish harmony and understanding, and to remove the fears that have kept the two communities apart for so long.” Aung San Suu Kyi said she would only accept recommendations from an advisory commission led by former UN chief Kofi Annan. A grenade explosion in the primarily opposition-supportive area of Bujumbura left one dead and nine others wounded on 14 June. Bujumbura saw major protests two years ago due to President Pierre Nkurunziza’s seeking of a third term. Anti-government protests have persisted even after Nkurunziza’s success, with the UN having estimated that the unrest has caused between 500 and 2,000 deaths and over 400,000 forced displacements in total. The UN Special Representative for the Secretary General in CAR, Mr. Parfait Onanga-Anyanga, has expressed deep concern over increased attacks on civilians and peacekeeping officers throughout the country, while emphasizing “the intensity of the attacks, their premeditated nature and the targeting of ethnic minorities” as particularly alarming. During his meeting with the UN Security Council on 12 June, Onanga-Anyanga discussed how clashes between the Muslim majority Seleka rebels and majority Christian anti-Balaka militia has pivoted the country back into conflict, and further stressed the need to “re-energize” the political process in CAR to stabilize the conflict-torn region. Additionally, he applauded the UN Multidimensional Integrated Stabilization Mission in the Central African Republic (MINUSCA) for successfully reducing violence in the northwest regions of CAR, despite MINUSCA’s recent criticism by warring factions in the country. The UN Office for the Coordination of Humanitarian Affairs (OCHA) has cited daily conflicts in Bria between Christian anti-Balaka and the Muslim Seleka factions. The violence has reportedly prevented the town from sustaining a livelihood, as tens of thousands of civilians have been forced to flee. Since the Muslim coalition forcibly removed President Francois Bozize from power in 2013, thousands have been killed in the country and up to a million have been displaced. French President Emmanuel Macron has promised to reinforce the partnership between Cote d’Ivoire and France in an effort to mitigate the security threat that extremist terrorist groups pose in the Sahel region. The cooperation on military and intelligence issues was prompted by the March 2016 attack in Cote d’Ivoire by extremist groups, which resulted in 19 deaths, including several civilians. The UN Refugee Agency (UNHCR) and other entities have requested $65 million in aid to assist the rising number of refugees currently flowing into Angola from the DRC. Clashes between militia forces in the country have displaced 1.3 million people and account for the 30,000 refugees who have now fled to Angola, though the UN estimates the number can easily rise to 50,000. UNHCR has stated that it needs $35 million to fund its planned aid operations for the rest of 2017, though currently only $10 million in aid has been received. Israeli Prime Minister Benjamin Netanyahu called on Sunday to shut down the UN Relief and Works Agency for Palestine Refugees in the Near East (UNRWA), which aids millions of Palestinian refugees. Netanyahu said UNRWA has perpetuated, rather than solved, the Palestinian refugee problem and that it incited anti-Israeli sentiment, asserting that the UNRWA should be “dismantled and merged with the United Nations High Commissioner for Refugees.” Chris Gunness, UNRWA's chief spokesman, responded this week by saying that only the General Assembly, by a majority vote, could change the agency's mandate. According to a report released on Monday by the UN High Commissioner for Human Rights, Zeid Ra'ad al-Hussein, both Israel and the Palestinians have failed to bring perpetrators of war crimes to justice. The report urges both Israel and Palestine to conduct prompt, impartial, and independent investigations of all alleged violations of international human rights law. The report also mentioned a “general absence of higher-level responsibility” in Israel for violations in Gaza, and said Israeli and Palestinian authorities must ensure that victims of violations during the long-standing conflict have access to justice and reparations. Iraqi forces on Tuesday reported progress in the US-backed campaign to liberate Mosul, the Islamic State's (ISIL) last stronghold in Iraq. Iraqi forces stated they had captured a district called Zanjili, which sits just north of the city’s historic center. With the loss of Zanjili, ISIL controls only two districts in the city. The battle of Mosul has been longer than expected because ISIL has been using civilians as human shields, making it difficult for Iraqi forces to advance. According to the UN’s Libya Sanctions Committee report released on 9 June, the UAE has allegedly supplied military aircraft to Khalifa Haftar’s Libyan National Army (LNA), which violates UN-backed international sanctions against the regime. The LNA has refused to recognize the UN-backed government in Tripoli, and has taken control over a large part of the country during the past year. The report also showed that direct foreign support to Libyan armed groups has been increasing, despite the continuing arms embargo against them. Mohammed al-Dharat, a member of the Libyan Parliament, indicated that the UAE could not have brought equipment into Libya without help from other countries. Sulaiman al-Faqih, a member of the Libyan Political Dialogue Committee, said the UAE has violated international law and has called on the country’s Presidential Council to submit an official complaint at the UN Security Council. South Sudanese rebels have captured the Kuek region after an intense battle between the government and rebel forces. The rebel movement loyal to the former First Vice President of South Sudan Riek Machar, SPLM-IO, has officially assumed full control of the region. Leaders of Sudan, Uganda, Ethiopia, Kenya, Somalia and Djibouti attended the Intergovernmental Authority on Development (IGAD) summit in Addis Ababa to discuss the South Sudanese conflict. The current First Vice President of South Sudan, Taban Deng Gai, was also in attendance, though leaders pointed out South Sudanese President Salva Kiir’s “noticeable” absence. The IGAD summit agreed that President Kiir should “strictly implement” a previously agreed upon ceasefire and that rebel groups must respect the terms of the ceasefire. The conflict has already led to the displacement of 3.7 million people and forced 5.5 million people to face food shortages.